The text is formed with uppercase letters [A-Z] and space. The first line of input contains a single integer N\,(1 \le N \le 1000) which is the number of datasets that follow. a space, and a text string consisting of uppercase letters [A-Z] and space. The length of the text string is guaranteed to be \le (R\times C)/5. For each dataset, you should generate one line of output with the following values: The dataset number as a decimal integer (start counting at one), a space, and a string of binary digits (R \times C) long describing the encoded text. 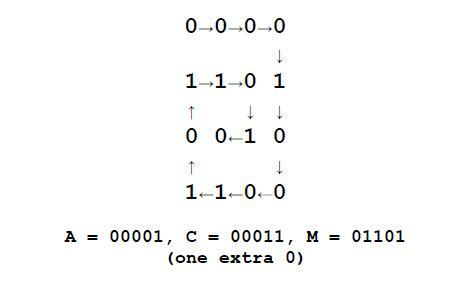 The binary string represents the values used to fill in the matrix in row-major order. You may have to fill out the matrix with zeroes (0) to complete the matrix.